Community Corner - Featured local business Roger's Tailoring. 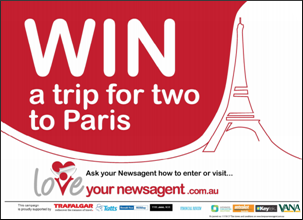 Tell us how much you Love Your Newsagent and be in the running to win a trip for two to Paris. To be in the draw for this fantastic prize simply complete the entry form in store or visit www.loveyournewsagent.com.au and complete a short survey and you will be in the draw to win the MAJOR PRIZE of a trip for two to Paris, valued at $10,000 and proudly offered by Trafalgar Tours. Post your overseas parcels early for Christmas to take advantage of savings offered by Sea Mail. 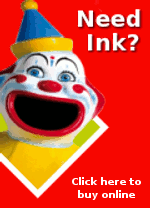 For example a 750gm to 1kg parcel to the UK is just $21.40 by sea mail compared to $38.75 by air mail. You may explore other examples using the link on our website to the Australia Post Postage Calculator.